Nordik Boots Model : 204-157-1044 $10.00 Sale Price Available in stores only. Limit 3. Per customer.Butikideal Flannel Sheet Sets or Duvet Covers - Twin $39.99 Regular Price $27.99 Sale Price 100% cotton. Double sale price $31.49 regular price $44.99. Queen sale price $34.49 regular price $49.99. King sale price $41.49 regular price $59.99.Skive Recliner Model : 718-16-1009 $229.99 Regular Price $149.00 Sale Price $80.00 Savings 2pc set. Tubular steel frame, swivel recliner and footstool with black faux leather seating. Armrests and base. 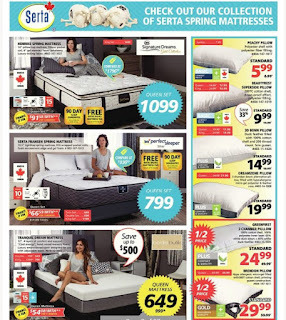 Serta Corinna II Spring Mattress - Queen Model : 802-167-1018 $619.00 Regular Price $399.00 Sale Price Up to 35% Savings 11.5" eurotop spring top. 720 continuous coil, gel foam inside. Twin regular price $449.00, sale price $349.00. Double regular price $499.00, sale price $379.00. King regular price $749.00, sale price $599.00. Medium comfort. Verticol inner spring. Warranty 5 years. Finance it for queen $33.25 mth for 12 months. Butik Basiks Oxford Bed In A Bag - Queen $79.99 Regular Price $59.99 Sale Price 25% Savings 7pc set reversible. 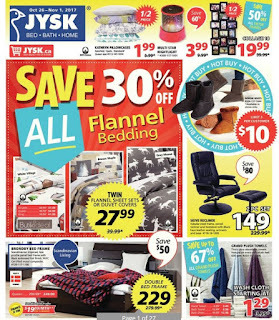 Tara Sherpa Backfleece Throw $29.99 Regular Price $19.99 Sale Price 33% Savings 130x160cm. Dina Basket Model : 316-127-1011 $9.99-$11.99 Regular Price $7.99 Sale Price Up to 33% Savings Wicker basket with removable cloth lining. 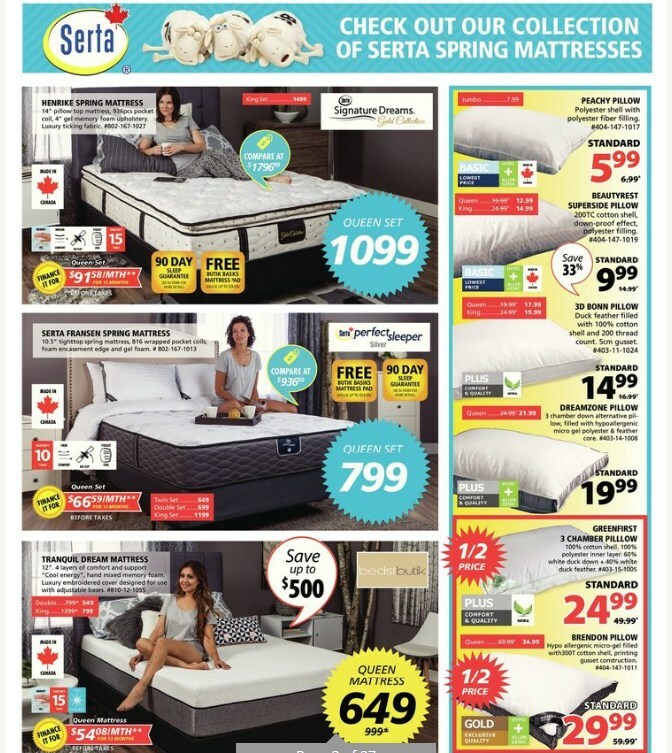 Serta Henrike Spring Mattress - Queen Set Model : 802-167-1027 $1099.00 Sale Price 14" pillow top mattress, 936pcs pocket coil, 4" gel memory foam upholstery luxury ticking fabric. Made in Canada. Finance it for $91.58 mth for 12 months. Compare at $1796.99. 90 days sleep guarantee. 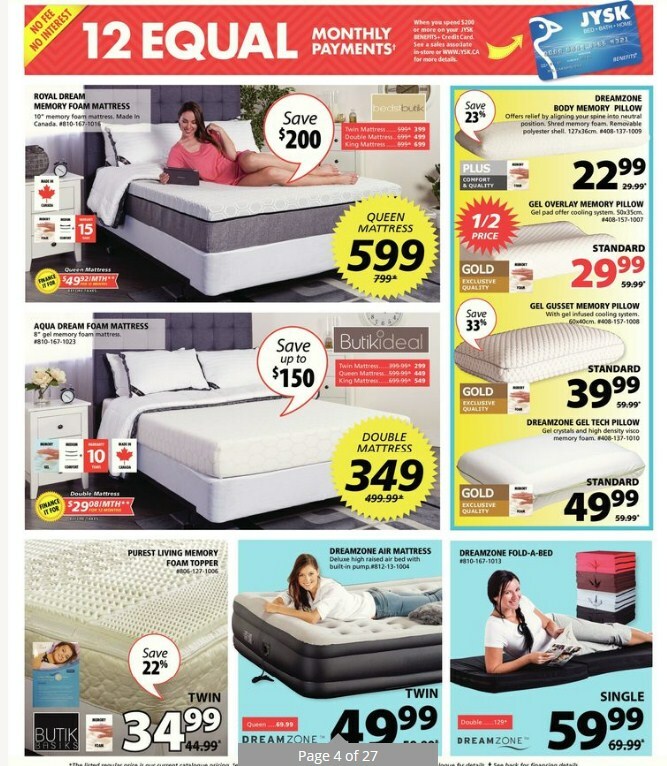 Free butik basiks mattress pad value up to $544.99. Serta Fransen Spring Mattress - Queen Set Model : 802-167-1013 $799.00 Sale Price 10.5" tighttop spring mattress, 816 wrapped pocket coils, foam encasement edge and gel foam. Made in Canada. Finance it for $66.59 mth for 12 months. Compare at $936.99. 90 days sleep guarantee. 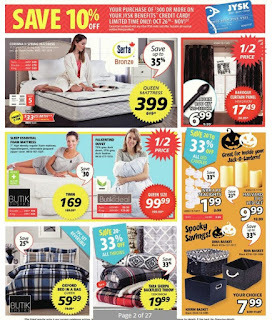 Free butik basiks mattress pad value up to $54.99. Twin set $649.00. Double set $699.00. King set $1199.00. 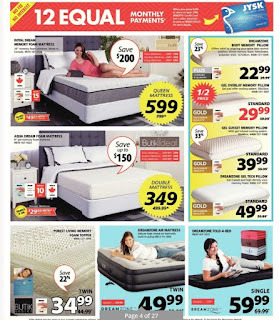 Bedstbutik Tranquil Dream Mattress Model : 810-12-1055 $999.00 Regular Price $649.00 Sale Price Up to $500.00 Savings 12". 4 layers of comfort and support "cool energy", hand mixed memory foam. Luxury embroidered cover designed for use with adjustable bases. Double sale price $549.00 regular price. King regular price $1299.00 sale price $799.00. Finance it for $54.08 mth for 12 months. Made in Canada. Peachy Pillow - Standard Model : 404-147-1017 $6.99 Regular Jysk Flyer Price $5.99 Sale Price Polyester shell with polyester fiber filling. Basic lowest price. Hypo + Allergenic. Made in Canada. Jumbo sale price $7.99. 3D Bonn Pillow - Standard Model : 403-11-1024 $16.99 Regular Price $14.99 Sale Price Duck feather filled with 100% cotton shell and 200 thread count. 5cm gusset. Queen regular price $19.99 sale price $17.99. King regular price $24.99 sale price $19.99. Greenfirst 3 Chamber Pillow - Standard Model : 403-15-1005 $49.99 Regular Price $24.99 Sale Price 50% Savings 100% cotton shell. 100% polyester inner layer. 60% white duck down + 40% white duck feather. Plus comfort & quality. Brendon Pillow - Standard Model : 404-147-1011 $59.99 Regular Price $29.99 Sale Price 50% Savings Hypo allergenic micro-gel filled with 300T cotton shell, printing gusset construction. Queen regular price $69.99 sale price $34.99.